The Pacific Northwest basin, covering a drainage area of 277,612 square miles, includes the "mighty" Columbia River. Based on its mean annual discharge (262,000 cfs, 1941-1970), the Columbia is the second largest river in the continental United States (Iseri and Langbein, 1974). With a length of 270 miles, a drainage area of 11,200 square miles, and a mean annual discharge of 35,660 cfs (1941-1970), the Willamette River is the fifteenth largest waterway in the United States ranked on the basis of annual discharge (Iseri and Langbein, 1974). Figure 13-1 highlights the location of the Willamette River case study watersheds (catalog units), identified in the Pacific Northwest basin as major urban-industrial areas affected by severe water pollution problems during the 1950s and 1960s (see Table 4-2). In this chapter, information is presented to characterize long-term trends in population, municipal waste-water infrastructure and effluent loading of pollutants, ambient water quality, environmental resources, and uses of the Willamette River. 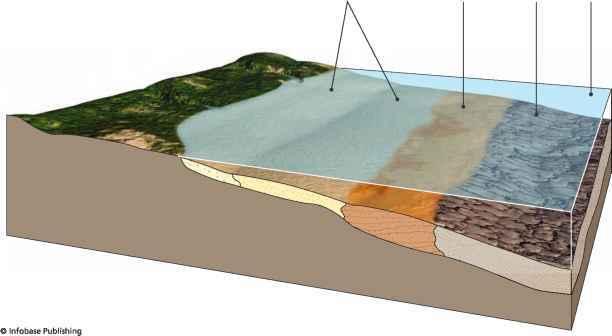 Data sources include USEPA's national water quality database (STORET), published technical literature, and unpublished technical reports ("grey" literature) obtained from local agency sources. 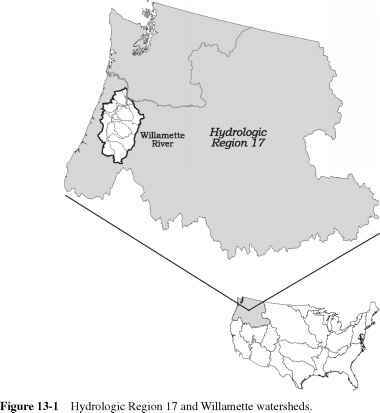 The Willamette River extends for 270 miles from its headwaters in the southern Cascade Mountains in Douglas County, Oregon, to the city of Portland, Oregon, where it meets the tidal Columbia River (Figure 13-2) (Iseri and Langbein, 1974). More than two-thirds of Oregon's population lives within the major urban centers that have developed in the valley. The basin provides extensive natural habitat for fish and wildlife and supports a prosperous economy based on agriculture, timber and wood products, and recreation.